This is a mock up of what I am thinking about on my Orange and Gray quilt. Tanya says Purple would be better with my gray so maybe I will have to do a Orange and Gray and a Purple and gray quilt. Today I was able to get 14 blocks done so far. So do you like Orange and Gray better or Orange and Purple? Here are 8 of the 14 blocks I have finished. Rebecca in the last couple days has made 3 more string blocks to add too our collection also. Tanya has done some work also but I will wait to let her show it off as she has a completed quilt that is in the wash.
Tanya and I went shopping today for some stuff I need to make a couple quilts I want to do.. More about that later. While shopping, I found a brown bag that said scraps $5 bucks. I do not know why, but I just can't pass up a good bag of scraps. Above is what I found crammed into the bag. Most of it I was able to cut up into 2 1/2 inch blocks (I love that size block and love making random quilt blocks out of them). I have been in a mood for a long time to make a new quilt. It will include tons of 2 1/2 inch blocks which leads me to what I bought. Any idea what colors my next quilt will be made out of? The picture does not show all of them well, but they are gray and orange (even though some of them might look white, they are not). The plan is to make a quilt with 5 X 5 blocks alternating in oranges and grays. Tanya still thinks I am nuts for liking orange, but every time I go shopping I seem to come back with more orange fat quarters. I chopped a few dozen pages into 6 1/2 inch blocks which just made my daughter give me a even more puzzled look. Then I showed her what we were going to use them for. My guild a while back made some string blocks for a charity quilt. They suggested using news paper, a phone book or dryer sheets as a foundation for the string blocks. I had none of those, so my pile of strings has just been growing. Well today I made my first string block and starting Sunday I am going to start Rebecca on a task to make more of them out of my scraps so we can make a string quilt. Well Rebecca and I (Richard) were doing the above. Tanya was quietly making a quilt top. She spent a lot of time leading up to Christmas quilting our Christmas wall hangings (which never got finished and is stuffed in a box for next year, well we did give away 10 or 11 of them so some got done). 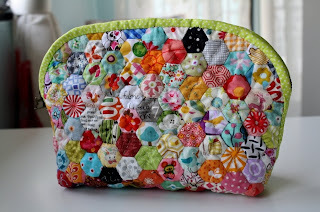 Any way she quilted all of them so I look forward to her quilting this quilt. 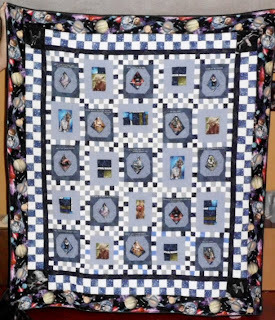 This is a baby quilt in size and its made out of Cowboy type materials. Very cute if I say so my self. Tanya did a fantastic job. I am looking for help making a charity quilt with these paper pieced swords and shields please look at this post for more details. Is it really Christmas already? Tanya and I have been overwhelmed and worn out over the last month, burning the candle at both ends. Tanya's mother had surgery, in which her foot was amputated and she lives a 4 hour drive from where the hospital is, but we live only 30 minute drive and as such we were the only family near her. We spent more time then we had anticipated visiting and comforting her. The plan originally was for 3 days at the hospital and 2-3 weeks in rehab and then back to her home. Well after just a few days at rehab, she decided she was not getting waited on enough and she talked us into staying at our house for a week. Oh boy did that put a monkey wrench into our family Christmas plans. Well my mother in law is now back home and doing well. Both Tanya and I are exhausted. Don't take this wrong, I love my mother in law, but I am so glad she is back home. I am tired, but it was great to let Grandma spend some quality time with our kids, which she is not able to see as often as she would like. So your wondering what I am making with my cool Architectures bundle from Carolyn Friedlander. I did not get the full bundle above, but I did get 17 of the 21 prints (its all I could find and I just had to have them). You might wonder what would I do with such a pile of wonderfulness and well I am glad you asked. This is the pattern I would use, but not exact order. Last week I was pointed to a neat program called FabLib that helps to import fabric swatches into my EQ7 app. You might be saying at this point not fair Richard got all the fun stuff. I did good this year getting Tanya presents. I bought Tanya Pieces of Hope a Riley Blake Design. We have 2 Autistic Children so this one hit home for us I look forward to seeing what Tanya makes with this. I did not stop there though I also got her another surprise. She likes Me and My Sister Designs and I bought her a Fat 1/8 bundle of Ticklish. Me and my family will now just take the rest of the day easy. I do plan though to try to make a sword from James pattern as I also got the material for it this last week. Have a fun and safe day. As for Julia today she got a walker/baby stroller and is cruising the house. These are the first 2 of many 12 day wall hanging that our family is making for gifts for Christmas. We wanted to make 40+ of them but we are running out of time we have these 2 completed and about 10 basted and another 5-6 tops completed. Are 4 of the the items linked up last week. Link up yours and lets see what you have been making. My son would like me to make the following sword and shield quilt and has created 2 paper pieced patterns. I tried to make the shield but it was too hard for me. Since neither James or I have experience with paper pieced things we need to know if the pattern is too complicated. The material we ordered for the sword showed up today so I have not yet tried that but it seems much less complicated so should be easy I think to make. Here is a mock up of the quilt. We have bought material just nee help advice so we can make the quilt. If any of you have experience in paper piecing we could use your help. 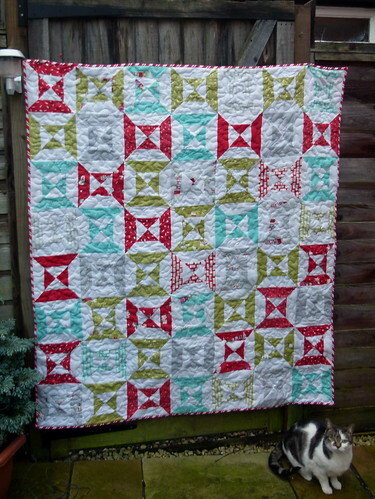 So any way this is my Quilting Challenge if any one wants to take me up on it? Here is a list of all those that have contacted me with completed blocks. I finished quilting the first of my 12 days wall hangings. The 12 days before Christmas is our kids favorite time of year. We pick 3 family's each year to giveaway too. We have done this for 5-6 years now. We give gifts each day for the 12 days leading up to Christmas Eve (Christmas is for family's so we end the day before). Each year we have picked completely different family s last year we picked 2 next door neighbors which is difficult as we do a sorta ding dong ditch delivery method (up tell the last day) then on Christmas eve we deliver a bigger gift with my whole family and put the kids (we generally pick family's with younger kids) out of their misery if they have not already caught us. They can finally see who has been bringing them treasures. 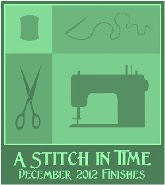 This year one of our gifts will be the 12 days wall hanging. We made it out of non Christmas material so it would be appropriate to leave it up all year and to help that family enjoy the gift of giving. So today is our 3rd day. Yesterday we had some wrapping paper and bows. The first day this year we gave some Christmas dishtowels. So what you ask is tonight? I am not sure my wife has a box that she loads up all year with "12 days gifts" we start buying the leftover Christmas stuff when it goes on sell the week after Christmas at a killer deal. So why do I tell you all about this? I want you to understand my desire to give at Christmas. So what do I want you to do? Pick a friend or even a enemy that is feeling a little down this Christmas and do something special for them. If not for your own desire do it for me. As I can only do 3 family's a year we set that limit years ago. Jared made another treat that I promised to share so here it is. 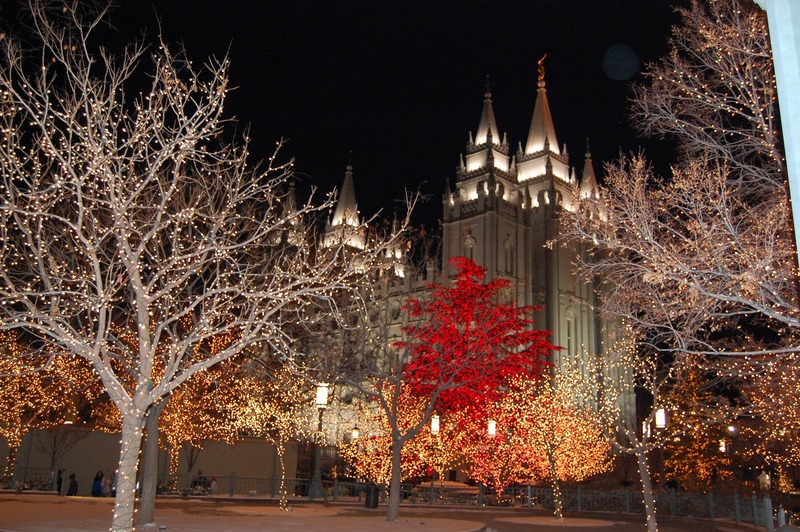 If you are interested in commenting to me today I am interested in family traditions. I have every year since I was married visited the lights on Temple Square here in Salt Lake City. It is a fantastic view if you have never seen it. I would like to add new traditions to my family but I don't have any great ideas do you? 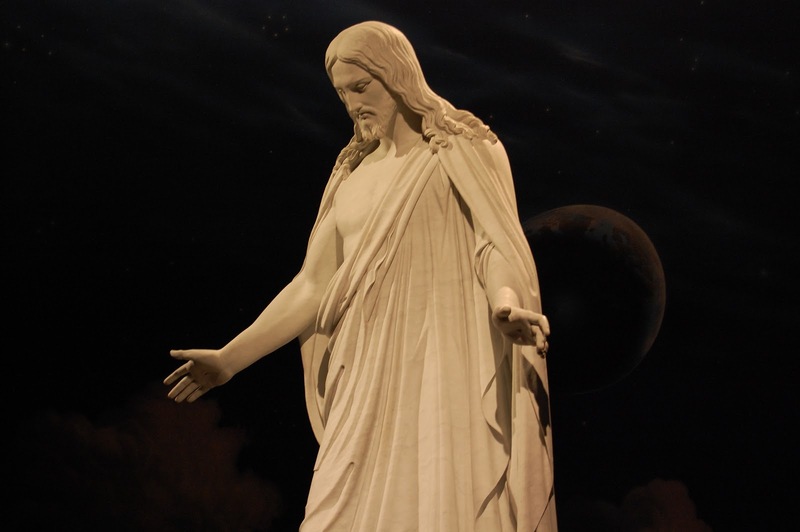 If you are interested you can find more of my Temple Square pictures here. so if you have not entered you still can. Above though you can see Rebecca's Pillowcase finish using our new serger she was so proud of her sewing. Are 3 of the the items linked up last week. Link up yours and lets see what you have been making. Tanya has 6 step brothers and sisters (her dad remarried two years ago), so we don't really know them. They are married and all have kids of their own. As part of our making every one a quilt we decided for the step siblings we would give each family a lap quilt and each kid would get pillow case. So between all of these we need a dozen or so pillowcases. So this weekend Tanya and I cut out about 2 dozen pillow cases. So far I have sewed the tops onto 11 of them and completed 5 of them. Above is the first one done (which I claimed and is on my bed). We have been trying to figure out what to get Rebecca for Christmas. We talked about a sewing machine or a serger, but the cost of them was more then I am willing to spend on a 14 year old girl. So I bought myself a serger (after all don't you just need to serge pillow cases?) I am sure some of you are saying no its not needed. You might find this funny, but I own a serger now, but have no intent to use it. I got it so my daughter can work on her home work assignments from her sewing classes at school. So far she has made a hoodie, shorts, a quilt, and now mostly done with a dress and she is going to make a matching one for Julia. Any way it is for her, but not for her. Any way we now have the most styling pillowcase. Here are the other 4 that are finished, we will have a few more done in the next few days. Today we are participating in the Blog Hop Party With Give-Aways. Sponsored by Quilting Gallery we participated in the last one and had such fun I had to do it again. We are giving away 11 fun black and white fat quarter prints. These fat quarters are from various designers. All are quilt shop quality fabric. Half are from our stash and the other half were bought for this giveaway. Here is a better look to see what they are. To enter, I want some help setting a new goal for Richard And Tanya quilts. 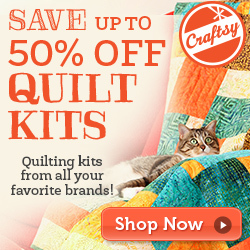 I am new to quilting (Me speaking of Richard) and Tanya is even newer then me. I made my first test quilt and finished it on Christmas Eve last year. My first full size (baby quilt). 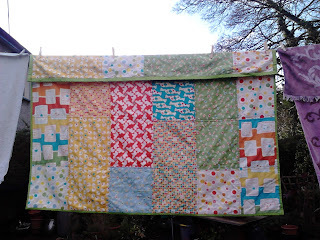 Yes I have a few issues with making big quilts (I have made over 50+ baby or lap quilts). But I have made up for the lack of size in the quantity I have made. 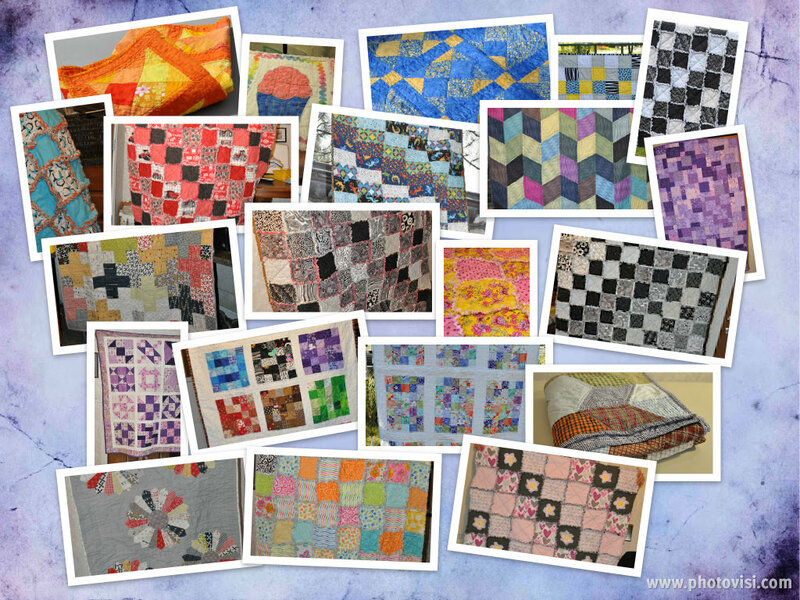 This is a collage of just a few (21) of our quilts that we have made this last year. 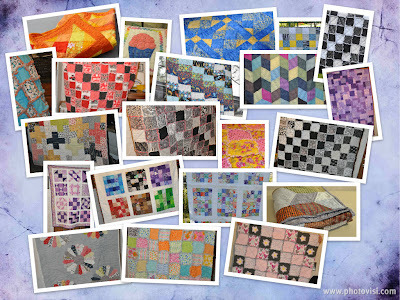 My goals for this year (2012) was to make 52 Quilts in the 52 weeks of the year. I am proud to say that I have exceeded that number. You can see some above and more can be found on my Quilt Finishes Page. Though most of Decembers have not yet been added. So to enter you have a few options. 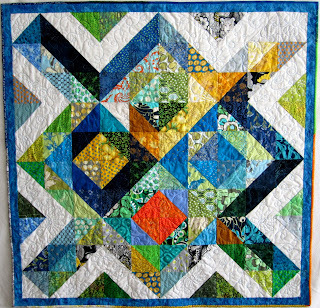 1) Leave a comment listing a suggestion for a goal for quilting in 2013. 2) (Bonus Entry) If you follow Richard and Tanya Quilts, tell me how you follow. 3) (Bonus Entry) If you like my quilts find your favorite on my complete page and tell me the quilts name. 4) (Bonus Entry) Tell some one about our giveaway. (I don't care how just spread the word. You can knock on the next door neighbors door if you like.) You don't need to tell me how you told some one, but you can if you want to make me laugh. So please leave a separate comment for each entry. Open to all any where in the world. We are willing to ship internationally. Contest closes Sunday Night, December 16th meaning any comments made before Monday when I will draw the winners name. My son Jared (he is 8) will help come up with some clever way to pick it in a random way. So 4 possible entries. Here at Richard and Tanya quilts I answer every email personally. I enjoy to communicate with my users. I hope you enjoy that and enjoy following my blog. You can find below some of what you might find in a blog post here. Enjoy your day and I hope that after you enter the many giveaways that you will come check us out and see what we are all about. Jared is in Christmas stress mode, I do not think it will come fast enough for him. I have been trying to keep him busy and off the computer. So today he made me a Flying machine and I told him I would show it off for him so here it is. I know your saying why is he still talking? You want to get to entering the drawing. The last few days this is what Tanya and I have been working on they are 12 day calendars you can read yesterdays post to get the link to the tutorial we are using to make them and learn a little more about them. We plan to make 40 of them before Christmas and I only have 4 made and basted sounds easy right only 36 to go? Now go enter the drawing already.